"The situation at the EU's external land border between Greece and Turkey constitutes a fundamental rights emergency. People, including pregnant women and families with small children, are held in inhumane conditions," FRA Director Morten Kjaerum commented. The situation in the detention centre in Soufli can be taken as an example: on 29 January 2011, the day of the FRA visit, 144 persons were being held in one room measuring about 110m2. There is no heating, and only one toilet and one cold shower are available for all detainees - with outside temperatures of around zero degrees Celsius. The European Committee for the Prevention of Torture (CPT) of the Council of Europe recommends 4m² of space per detainee in multi-occupancy accommodation. Nevertheless, no emergency measures have been implemented by the Greek authorities to address the conditions in detention centres in Evros - despite the availability of EU funds. 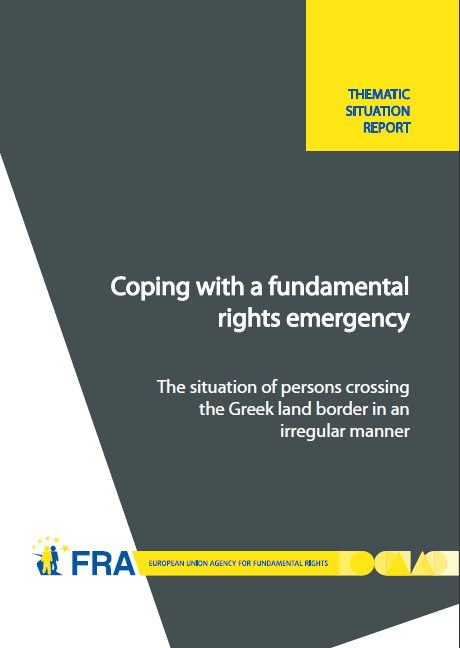 The FRA report identifies a number of factors which contribute to the current crisis, for instance, that everyone - except for persons requiring urgent hospitalisation - is automatically detained, including children and even babies. Coordination of the local response in the Evros region is a key problem. Responsibilities for migration management are divided between four different ministries and allocation of responsibilities at local level is unclear. One obvious way forward in addressing the immediate needs is the development of much stronger coordination mechanisms at a local operational level, which has proven to work effectively in other EU Member States. Data and information for this report were directly collected by FRA staff through interviews with key actors, including people in detention as well as all relevant public authorities, and through direct observation of conditions at the border and inside detention centres; secondary data complemented the field research. The Greek government provided unimpeded access to all detention facilities to the FRA. Frontex provided important assistance in facilitating the field research. Since 2010, Greek external EU land and sea borders account for 90% of all detections of irregular border crossings along all EU external land and sea borders. Daily crossings at the eastern border in Evros reached peaks of up to 350 persons. The largest group of migrants (44%) comes from Afghanistan. In 2010, 45 people lost their lives trying to cross the border in the Evros region (see FRONTEX).